Mitch McConnell got punk’d…by a blog. Well, more like his staff who wrote a letter on behalf of a constituent to Elizabeth King, the Assistant Secretary of Defense for Legislative Affairs. 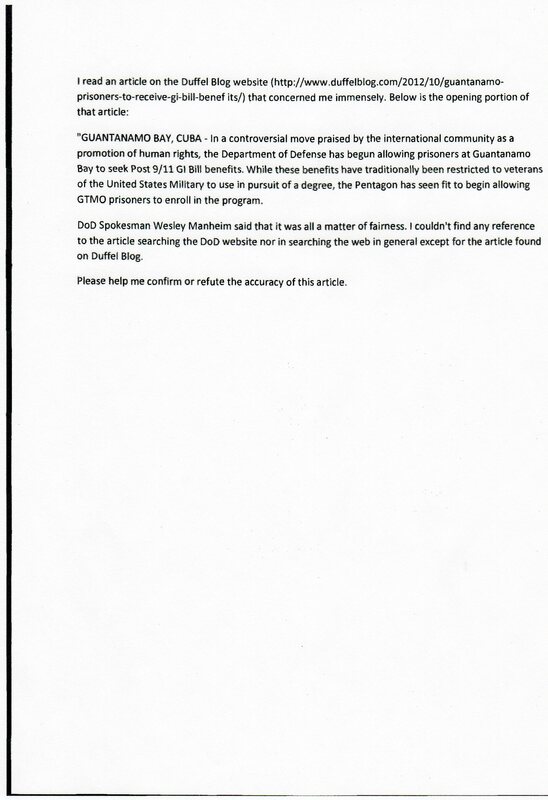 As the Pentagon’s congressional liaison, McConnell’s staff appropriately forwarded a concern regarding Guantanamo Bay prisoners receiving post-9/11 G.I. bill benefits. On Nov. 14, 2012, the Senate Minority Leader wrote the following letter that was uncovered by Wired magazine’s Spencer Ackerman. In the contituent’s note, which was also uncovered by Wired magazine, the individual points out that there was no information about this online, not even on the Pentagon’s website. Instead, the constituent the only place such a claim can be found is in an article on The Duffel Blog, a military news satire website. The Last Word traded emails with Senator McConnell’s office on Thursday to try and confirm who wrote the letter and if the Republican leader knew if the letter existed, but the staff did not offer any answers to those questions.